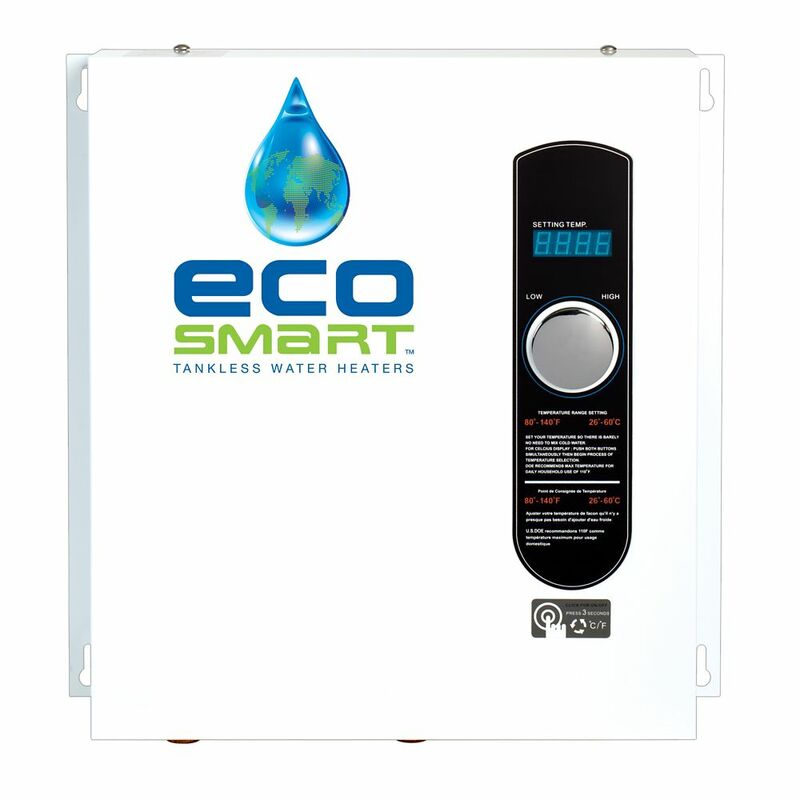 EcoSmart Electric Tankless Water Heaters, also called Instantaneous On Demand Water Heaters, provide endless hot water on demand and only as needed. Self modulating flow sensor technology regulates the amount of energy required to heat the water needed. This Smart Technology electric tankless water heater is configured for climates where incoming water temperature can reach as low as 37 Degrees Fahrenheit. This model is well suited for homes in the Northern U.S. and Canada and in the southern U.S. that have large Roman-style or Jacuzzi tubs and that have generally more demanding water usage needs. The Eccotemp EZ Flush Descaler Kit quickly dissolves water scale, rust, lime and other water-formed deposits, restoring efficiency to most all water appliances using a non-toxic concentrate certified to NSF/ANSI 60 for use as a cleaner in potable water systems. Designed for tankless water heaters providing >" hot and cold service connections (although compatible with most water operated equipment), the EZ Flush can significantly improve efficiency, conserve energy and extend the useful life of equipment, saving you both time and money. Get your water pumping like never before with the Flojet 2.9 GPM 50 PSI Water Pump - a smartly designed unit that will bring pressure to your outdoor showers and cleaning jobs. The Flojet Pump works great with Eccotemp L5, L7 and L10 Tankless Water Heaters. It features a built-in pulsation eliminator that ensures smooth flow without the need for an accumulator tank. Soft, absorbing mounts reduce annoying vibration and noise and the self-priming feature allows the pump to safely run dry. Snap-in " port fittings simplify installation. Made of corrosion resistant materials, the Flojet water pump will keep your water pressurized for years to come. 24 Kw Self Modulating Electric Tankless Water Heater EcoSmart Electric Tankless Water Heaters, also called Instantaneous On Demand Water Heaters, provide endless hot water on demand and only as needed. Self modulating flow sensor technology regulates the amount of energy required to heat the water needed. This Smart Technology electric tankless water heater is configured for climates where incoming water temperature can reach as low as 37 Degrees Fahrenheit. This model is well suited for homes in the Northern U.S. and Canada and in the southern U.S. that have large Roman-style or Jacuzzi tubs and that have generally more demanding water usage needs. 24 Kw Self Modulating Electric Tankless Water Heater is rated 4.4 out of 5 by 61. Rated 5 out of 5 by Au from Needed to make some electric wiring changes but well worth... Needed to make some electric wiring changes but well worth it. Love the tankless water heater. Rated 4 out of 5 by af from The water comes out hot, and takes up little space.... The water comes out hot, and takes up little space. My electrician had trouble getting the 3 large wires in through the small port on the bottom since he was using flexible conduit. The port could be larger. Still waiting for my next electric bill to see what kind of energy savings we are getting. Rated 5 out of 5 by Maynuh from I purchased this heater to replace one similar to it (an older model) which stopped working. Sinc... I purchased this heater to replace one similar to it (an older model) which stopped working. Since the wiring and water connections were there already, installation was really easy. In less than an hour, I had hot water back. I installed a 2 gallon per minute flow regulator at the outlet connection to maintain a constant flow rate through the heater, which helps it to maintain temperature more accurately. In northern areas, the incoming water temp is colder, so the flow rate should be decreased accordingly to assure adequate output temperature. In Maine, 2 gal per min is just about right. The flow regulator should always be installed at the hot water outlet of the heater. Rated 5 out of 5 by Gemini from I love having the water heater on demand rather than having wasted electricity all day long just ... I love having the water heater on demand rather than having wasted electricity all day long just heating a tank of water. My husband I stalled it and we were good to go. Rated 5 out of 5 by Mike from Tankless water heater is great, purchased the ECO-24. It’s the... Tankless water heater is great, purchased the ECO-24. It’s the second one I have purchased one for the condo the other for the house. Should have made the change from hot water tank to tankless water heater years ago. Very satisfied. Rated 5 out of 5 by Mac from I Installed the 24 KW 2 months ago when my well water was 42 degs. All the faucets are within 15 ... I Installed the 24 KW 2 months ago when my well water was 42 degs. All the faucets are within 15 ft. of the heater and it doesn't take any longer than my old gas tank heater to get hot water. We were surprised and happy on day one and we wouldn't have it any other way today. Rated 4 out of 5 by LarryG from I have a place in the mountains of Arizona, our water coming out of the tap in winter can be down... I have a place in the mountains of Arizona, our water coming out of the tap in winter can be down to 40 degrees and this model does a good job of heating the water. Here are a few notes, 1st it takes awhile to get the hot water flowing so water conservation is not a sales pitch, you won't be saving any water... 2nd with the water that cold, only 1 water source can be used at a time (1 shower, dishwasher, washing machine etc). The good, if you have a big tub it can be filled all the way up, then someone else can take a shower, wash dishes etc and have unlimited hot water.